Any kind of construction works is preceded by certain calculations. In the preparation of future building foundations, equipment pits, etc. must first calculate the volume of soil. From the correctness of calculations depends on the effectiveness of the backfill. Inspect the plot develop the soil and subject to irregularities and their sizes. Minor irregularities will not have a material impact on the result of calculations, but at the same time, the inspection will allow to determine the percentage of error. The calculation of the volume of soil is to determine the volumes of various geometric figures. Take the dimensions of the pit and determine the amount of soil according to the following formula:V = H / 6 [(2A + A1)B + (2А1 + A)B1], where h is the depth of the pit;and – the length of the sides at the base of the pit;A1 and B1 – the length of the sides on the surface of the pit. Determine the volume of the underground part of the structure using formulas from algebra course. Then, calculate the volume of backfill sinuses of the pit. It is equal to the difference between volume of excavation and volume of the underground part of the building. The accuracy of this calculation depends on the correctness of the produced measurements of height, width and depth of the underground part of the future facility. 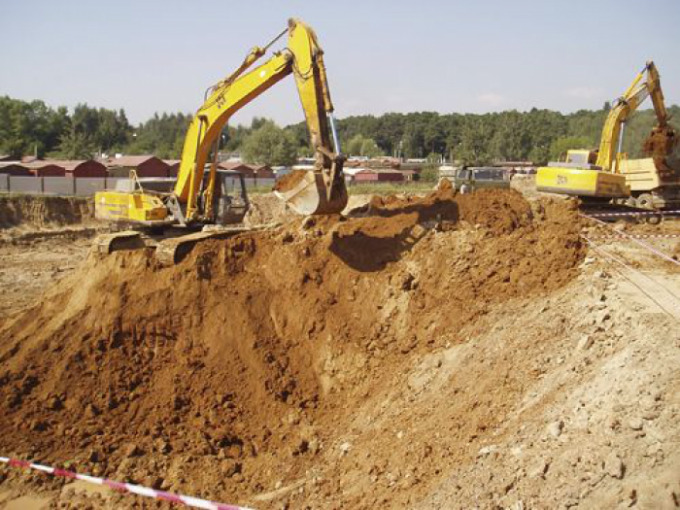 After all the calculations are performed and verified, you can begin excavation. It is necessary to break the area of the upper and lower contours of the pit. The correctness of the planned development is checked by the sight of the poles exhibited along the lines of the future of the pit. For competent design of the slope requires the use of special templates and other professional fixtures. During the development of pits it is periodically necessary to control measurements, which will help to make a diagram of the pit. On the basis of this scheme is actually produced, the volume of earthworks, as well as the act of the executed works. The volume of exploited surfaces in most cases is measured by the cubic yards of soil. But when planning or seal surfaces with a unit volume of soil can be square meters.